My husband is brilliant. Not that I didn’t already know this interesting factoid, it’s why I married him after all. But he showed his brilliance once again recently when he was cleaning out the garage. 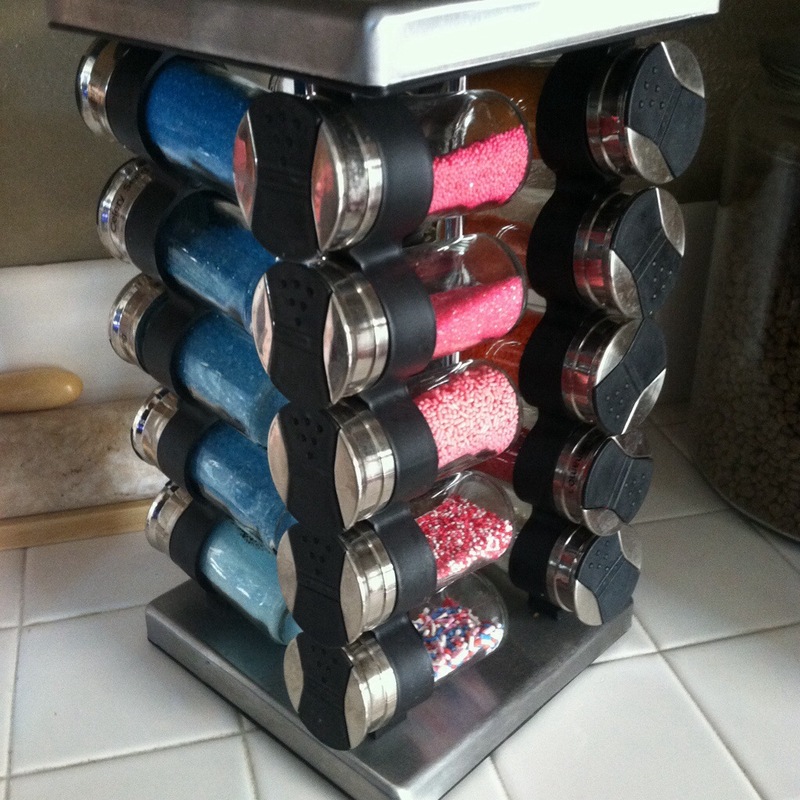 I had put an old spice-rack in a yard sale pile thinking I had no need for it. It was full of spices I didn’t use and, as much as I liked how cool it looked on my countertop (it made me feel like a better cook than I actually am), I figured I could get a little cash for it since I honestly didn’t use it. But DH saw it when he was cleaning and organizing our junk and thought of a great idea for it. You see, when we had our house tented for termites this last summer, we had to bag everything. It was a horribly tedious project that happened to highlight how many sprinkles I have acquired over the last few years. I have a couple dozen little cups of sprinkles in all the colors of the rainbow. And when DH was cleaning the garage he saw the old spice-rack and for some reason thought of the sprinkles. 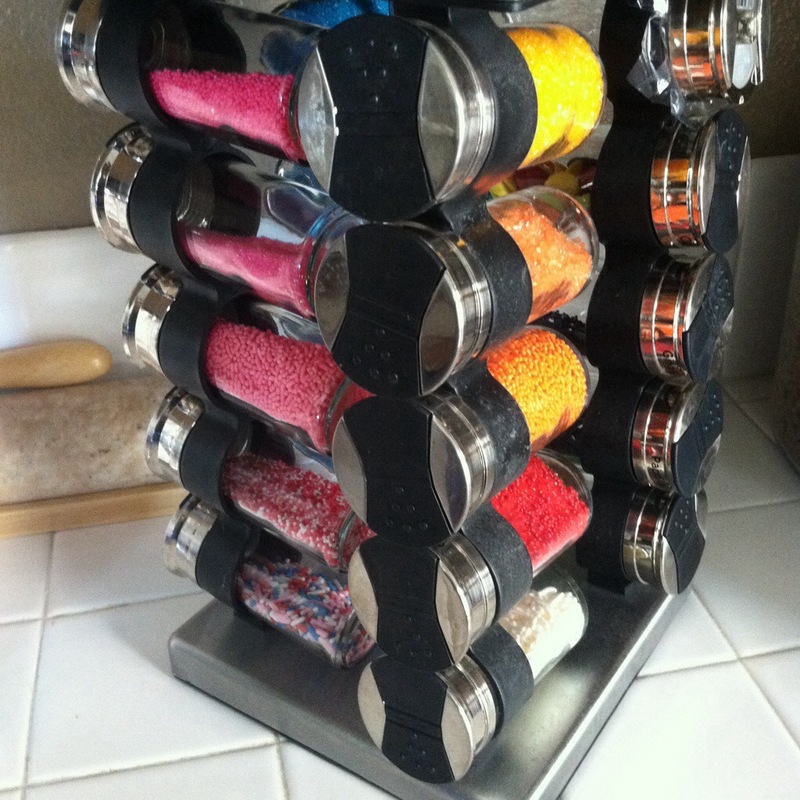 And that’s how my brilliant husband came up with the brilliant idea to use the old spice rack to store my colorful sprinkles beautifully displayed instead of hidden away to be forgotten about. .